Deep into the Woods Timelapse from Henry St leger on Vimeo. ..includes live music and live drawing.. Seven members of a new illustration collective present their second exhibition 'Illustration' at Motorcade/FlashParade from Thursday 21st to Sunday 24th April. The collective gradgallery.co.uk was established in 2010 by a group fo University College Falmouth Illustration graduates, with the aim of exhibiting and promoting their illustration to a wider audience. On display will be a diverse cross-section of contemporary illustration produced in a range of media. This will include children's illustration, editorial and advertising work, photography, greetings card designs and fashion illustration. Members of the collective have already had commissioned and published work. The collective are hoping the exhibition will showcase this alternatived to Fine Art to a broader and more diverse audience. Original artworks, limited edition prints and greetings cards will be available to purchase at the exhibition. 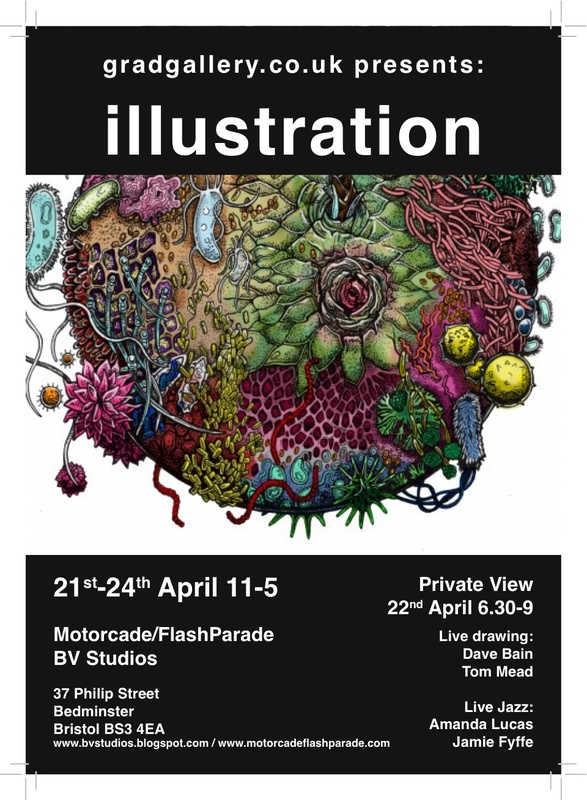 You will also be able to meet the illustrators whose work is on show. The private view will include live music from Amanda Lucas and Jamie Fyffe, live drawing from Dave Bain and Tom Mead and a bar.